Another day, another compilation from the doyen of intelligence researchers Robert Sternberg. This time he has rounded up the 19 most cited researchers in a selection of the most successful textbooks on intelligence (it was 20, but Earl Hunt was sadly too ill to contribute), and asked them to reflect on the field, and their own particular contribution to it. These selection criteria make for sometimes rather stodgy reading: we get résumés of their own work by familiar names such as Ian Deary, Linda Gottfredson, Anders Ericsson, James Flynn, Howard Gardner and Sternberg himself, most of which add little new. We also get multiple revisitings of hoary old debates about nature and nurture, what intelligence tests ‘really’ measure, the centrality (or otherwise) of conscious, deliberate, abstract rationality, and whether ‘intelligence’ is a separate general purpose faculty, distinct from say personality or memory, or not. These will be useful for readers who are not already familiar with the many places where they have already been discussed, sometimes ad nauseam. For example, the ability to intervene intelligently in the flow of events in order to progress one’s own interests clearly depends on an astute, informed capacity for prediction and anticipation. Yet detailed, intricate work on how prediction is central to the whole nature of cognition – see, for example, Andy Clark’s Surfing Uncertainty – has not yet penetrated the bubble of the intelligence research community. And recent work that challenges the core assumptions on which the study of intelligence has been traditionally based, some of which is now widely available in accessible form, is largely missing. For this you could read Todd Rose’s The End of Average, Richard Nisbett’s Intelligence and How to Get It or – my personal favourite at the moment – Ken Richardson’s Genes, Brains and Human Potential: The Science and Ideology of Intelligence. There are straws in the wind in Sternberg’s anthology, but you have to catch them yourself and weave them into your own basket. 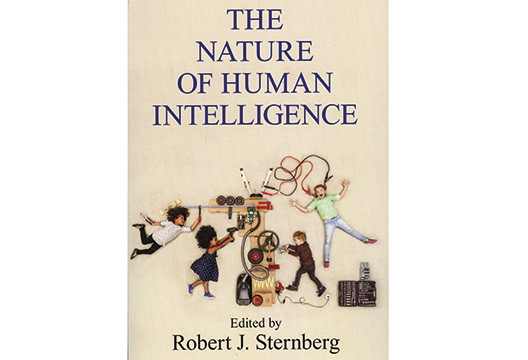 Sternberg and others insist that intelligence isn’t exclusively an intellectual faculty. Diane Halpern reminds us of the importance of beliefs, biases and strategies. (Keith Stanovich has shown that people with high IQs are as liable to confirmation bias as the rest of us. Carol Dweck’s work shows that believing that intelligence is a fixed commodity subverts people’s intelligent engagement with novel challenges.) Scott Barry Kaufman, in a refreshingly personal account of his own journey towards a richer understanding of intelligence, quotes David Wechsler – he of the WAIS and the WISC – saying ‘general intelligence cannot be equated with intellectual ability, but must be regarded as a manifestation of the personality as a whole’. Kaufman also reminds us of the role of motivation, for instance of research that shows that IQ scores can be significantly improved by paying people to do them. And Zach Shipstead and Randall Engle have a good go at combining work on fluid intelligence and working memory into a model that holds out some promise for understanding real-world smarts. A core part of the problem is that intelligence is not a scientific concept. It reflects a value judgement, made by someone, or some culture or society, that some behaviours are ‘better’ than others. Intelligence is ‘mind at its best’ – and we won’t be able to make much progress until we have both a decent overview of ‘mind’ and an anthropological awareness of what ‘best’ means to different people. For both of these we are still waiting. - Guy Claxton is Visiting Professor of Education at King’s College London. Find more from him in our archive.